I may be the exception to the norm when I say I prefer Luigi to Mario. If given the choice I’ll pick the green over the red, the lanky over the stout, and the underrated over the show-off. To me Mario is full of himself. Talented he may be, but he knows it, and that’s not an attractive quality in anyone. So when it was announced that Luigi would once again be starring in his own ghost-busting adventure, I was overjoyed. It was time once again for the younger brother to take his turn in the spotlight. Little has changed in his decade away, too. So little in fact that the setup for Luigi’s Mansion 2 tries to carry directly on from the GameCube original: simply put, Professor E. Gadd is again experiencing paranormal issues and abruptly teleports Luigi into his lab to help. As plot contrivances go it’s not subtle, and it sets the standard for a rather perfunctory tale. Citing a mysterious crystal only known as the Dark Moon, the usually friendly ghosts are now running amok. Having amassed a sizable property portfolio since you last met, the professor insists on sending you in to each of his mansions in turn to rid them of the squatting ghosts and to unravel the crystal’s secrets. However the story presents itself, the upside is that there are now multiple haunted houses to explore. Though Luigi may have tentatively explored just one originally, now he can tiptoe through old clock factories, icy retreats and flourishing greenhouses. The separation allows far more exploration of the different themes and at points our hero will be slipping up a snow-covered drive or examining a botanical garden surrounding a swimming pool, all showing off the graphical muscle of the diminutive handheld. Though it’s not just the special rooms that get all the attention, as each comparatively mundane area is filled with incidental items. The inclusion of dressers topped with knickknacks and workbenches covered in tools presents each room as being as important as the last, and ties together a mansion’s feel. All the time we’re admiring the surroundings my favourite plumber bumbles about, giving the distinct impression he’d rather be anywhere but there. Given that you’ll be staring at him for great periods of time, Nintendo have rightly spent a great deal of care and attention on his animation and he’s full of surprises and exudes as much character as his surroundings. From nervous glances when first entering a room to chattering to the professor on DS, or even humming his own theme tune, he takes full advantage of his turn in the limelight. Nowhere is this more obvious than when he’s taken unawares by secret passages. On more than one occasion the poor fellow takes a moment out to sit on a plush chair or lean on against an innocent wall only to trigger a rotating door that sends him crashing to somewhere new. Be it treasure or hidden passages, most of the rooms hide a secret and the majority are unearthed by your trusty Poltergust 5000 (vacuum cleaner) and stroboscope (torch). It’s amazing what you can do with a Dyson strapped to your back as canvases are sucked from frames and curtains are ripped from their runners; no material is apparently safe from your nozzle. Conversely to that destruction, your torch can reveal items that were otherwise hidden, patching pipework and repairing bridges. The controls are simple enough but the lack of a second analogue stick means that paying attention to anything above or below your normal arc is a tad awkward. Holding down X will cause Luigi to tilt back, which may sound simple enough but marry that with pressing A to shine your light and the right trigger to vacuum and you have the makings of cramp. Whilst serviceable, it’s awkward and frequent enough that it desperately cries out for a right stick to replace the buttons. Not everything you discover when sucking and blowing your way around the houses is treasure, however, and many times you’ll disturb the ghostly residents who don’t react kindly to your intrusion. Though not quite as varied in size and shape as in the Gamecube outing, what they lack in diversity they make up for with props. Often you can spy them through holes in the wall having pillow fights or caught painting portraits of one another, and when cornered they’ll be surprisingly resourceful. Some may don sunglasses to protect themselves from your stunning torch or carry makeshift shields to resist the Poltergust. All have their little patterns that you can break through relatively easy, and once you do it’s just a case of grabbing on, hoovering, and then pulling in the opposite direction until you’ve worn them down enough to be reeled in. Imagine a paranormal Sega Bass Fishing. Despite their best efforts none prove particularly challenging, though it’s easy enough to fall if outnumbered and cornered as the tight rooms mean it can be hard to dodge successive attacks. When you do, the first of the chinks in its haunted armour begins to show. Luigi’s Mansion has a very old school approach to death and it’ll dump you right back at the beginning of the level. For a game that is relatively casual for the most part this seems like an extreme punishment as levels average at between 20 and 30 minutes long. The level structure as a whole sits uneasily as for a portable game, such relatively lengthy slices – with no mid-level save – seems odd. A far better option would have been a more open and flexible mansion. As it is each level resets the respective mansions to a specific set of locked doors and primed monster closets, but I feel it would have been a far more enjoyable game if the whole mansion was available to explore from the off and E. Gadd just directed you about from afar. Currently the continued return to his lab for some mindless wittering simply breaks the flow of your ghost-busting. Especially early on the staccato nature of your missions almost undermines the strengths of the game, with the strong draws of the exploration and glorious originality in each room dampened by the repeat visits and restrictive objectives. The balance is that this regimented structure is perfectly suited to the online mode. An enjoyable affair where four players head off about a set a rooms to rid them of ghosts before heading to the exit. It’s surprisingly easy to play given Nintendo’s track record with online, though sadly lacks the voice chat required for proper coordination. For a game that I have waited a decade for, it leaves me with mixed feelings. Though overall the game is a light-hearted, enjoyable, and charming affair that keeps the spirit of the original alive, it has moved backwards in other areas. Namely the open mansion being replaced by levels, and the uniquely themed ghosts giving way to a series of generic spectres with novelty hats. That may be the weight of my expectations speaking, yet what is evident is the charm and character that both Luigi and the environments bring to every aspect of Dark Moon. More so than any other character in the Mario series, Luigi in this setting is given a chance to display his distinct personality. The continual vacuuming of abandoned cupboards and dusty corners may grow a little repetitive by the end, but to see what is in the next room and how Luigi will bumble through it will always bring a smile to your face. Pull on your wrestling masks and jump into the ring of Guacamelee. Drink Box’s follow up to Mutant Blobs, it continues to show the studio’s bold, colourful style. You’re not rolling around this time, though; you’re saving a Mexican village from the undead through your patented brand of piledrivers and justice. Look out for lots of nods to other videogames in the background. Lego games have steadily been getting larger. A long time ago in a game far, far away we were once blessed with a tiny cantina that formed our mini-fig’s hub world. Ever since then Traveller’s Tales have slowly but surely been growing their ambition: Indiana Jones had his museum; Harry Potter ran around Hogwarts and its grounds; and more recently the Hobbits toiled through a scaled Middle Earth to a blocky Mount Doom. All were impressive in their time but what Undercover achieves sets a new Lego standard. To call Lego City a hub world would be doing it a great injustice; it’s a world in its own right. Streets filled with traffic criss-cross the map, flanked by towering buildings and minifigs out for a midday stroll. Residential areas filled with gardens and driveways give way to industrial docks on one side and a forest covered mountain the other. All the time all manner of cars, boats and trains make their way about town as you stand grinning like a buffoon in the centre wondering just what you can break first. Though Grand Theft Auto may have done something similar over a decade ago, the childlike glee I find in watching these Lego folks stroll about town is unrivalled. It may be because I’m so used to branded experiences that seeing a “normal” Lego game is a novelty, but the charm that exudes from a city made of Lego can be seen built into every corner. Be it the tiny shop window displays, the snippets of dialogue you catch as you walk past others, or the comedy posters pasted onto billboards, each has a huge amount of care and attention lavish upon them truly flesh out the world. This is helped further by the inclusion of some very large personalities. Until now the humour has always come from parodies on specific films, often giving sombre or dramatic moments a flippant retelling. Here there’s nowhere to hide as they tell their own tale of how you, Chase McCain, track down master criminal Rex Fury, but even before the end of the opening titles you know it’s going to be ok. Pulling in references from countless movies and mixing it with their own comedic writing they had me chortling before I even took control of Chase. It’s a theme that continues throughout and takes full advantage of being unshackled from a specific IP. Undercover plunders the archives of cop shows and cult films for sneaky references and gags, liberally sprinkling them about whilst managing not to alienate anyone who isn’t old enough to have seen the likes of Dirty Harry or Starsky & Hutch. It walks that fine Pixar-esque line, throwing in as much for adults as it does for kids and rarely fails. Where it does falter however is when its patently trying too hard, as a very tired Arnie homage proves later in the game. Away from the cutscenes, it’s traditional Lego platforming fare, though split between the open world and the tighter, more controlled levels synonymous with the series. The latter unfold as you progress through the main story charting Chase’s pursuit of Rex, and it’s not long before circumstances have you swapping your police badge for miner’s overalls, fireman’s helmets, and an astronaut space suit as Traveller’s Tales take full advantage of all the Lego sets they can find. Whilst they fall into the usual Lego trope of each offering a unique talent, such as using dynamite or hacking down doors with a fire axe, the greatest relief is they’ve finally moved away from sending small children through hatchways. However, although polished and up to their usual high standard, these self-contained levels do little to excite me as their formula is exceedingly well rehearsed. To a certain extent I feel I know exactly what’s coming and am going through the motions. Instead, where Undercover begins to sing is when you’re out in the open. The city isn’t just well built but also chocked full of secrets. Stroll down any street and you’ll see ladders or disguise-specific actions trying to tempt you off of your current course. Some may be as simple as donning your thief outfit to break into a garage to steal a car, triggering a race back to the hideout before the police get you. Others may see you chain through most of Chase’s alter egos, taking you high above the streets collecting extra disguises, unlockable vehicles or mega-bricks. These rooftop detours are probably the most interesting as they lead you up and away from the city streets and allow you take in just how large and well laid out the city is. They’re a lovely piece of design too as one unlockable might lead onto the path of another, and another, and before you know it you’re a mile away from where you started. Embracing this unrestricted sense of platforming, free running is introduced to the series for the first time. Indicated by a smattering of blue and white blocks, they regularly appear on walls and fences across the land and encourage you to see where they might lead. Though effectively a rooftop time-trial, they show off some very slick animations, and if timed right you’ll be forgiven to thinking it’s Lego Mirror’s Edge as you fly around the city, bouncing off walls and sliding down zip wires. With such a plethora of options – each disguise has a number of unique collectibles or activities on top of the car chases and foot races – it would be easy to miss things, but here the Wii U’s gamepad comes to the fore. Lego City’s police force are also issued a pad and holding it up in scanner mode will see Chase scan the area for secrets, marking them on the map for further investigation. Though not crucial to proceedings, it’s a nice added extra alongside the traditional map view that makes Undercover feel at home on Nintendo’s dual screen platform. With so much going in its favour it’s a shame that I still have one large complaint. The Lego games are famous for their consistently well-executed co-op experience but here I’m left wanting. The technical pressures of rendering a full metropolis is far too much to have another viewport lobbed into the mix, and so whilst understandable it is a comparatively lonely experience. Nevertheless, that shouldn’t detract from what has been achieved. For a long time, though amused by their takes on pop-culture, the formula was getting too stale for my liking. What Lego City does is blow that wide open. For the purists there are still the core missions, but away from those there’s whole world to explore. Take a sports car for a drive down to the harbour, run over rooftops in search of treasure, or just walk the streets and admire the mini-architecture on show. There was a risk that such a venture would be style over substance but this is no lazy façade. The only thing lacking when compared to Grand Theft Auto are the guns. Yet what it has in spades over its more mature counterpart is so much charm that you’d wish Liberty City was made out of studs. Who ya gonna call? How about a lanky plumber with a love of the colour green? Join us as we take Luigi and his vacuum cleaner through the spooky corridors of a haunted house. Does it still have the charm of the GameCube launch title? How does the 3DS handle the controls of a previously twin-analogue game? How many times will James get eaten by a plant in the first three minutes? The answers to this and more within. It’s been a while since we looked at a simulator. Most of the time we’ve played with bridges or heavy machinery, so this time we thought we’d try something a little more squishy. Join James, Manny and Matt as we try our hand (literally singular) at refined butchery. We’ve all seen the Lego games. We know what Traveller’s Tales can do when given a tight, controlled level to fill out with their own brand of stud-based entertainment. But how are they with an open world? Join us as we delve into the life of an undercover Lego cop, pushed to the edge, willing to dish out his own brand of justice… dressed as a gladiator and continually distracted by a festoon of collectibles. Complete with Wii U gamepad picture-in-picture. The recently experiments have continued, and this time we’re pushing out away from the standard loaf. Above is my entry into work’s charity bake-off. 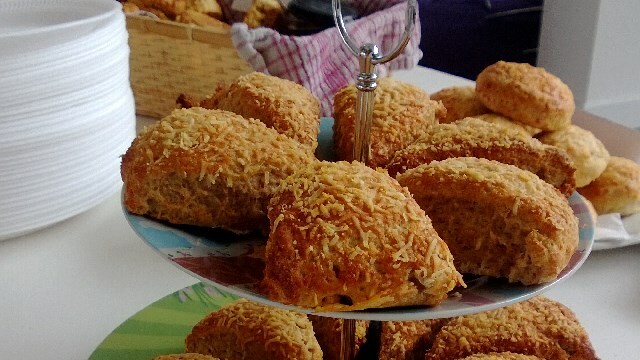 An attempt to balance the countless sugary delights with something a little more savory: cheese scones. As with most of my initial stabs they were a tad dense but they seemed to go down ok as nary a crumb was left at the end of the day. 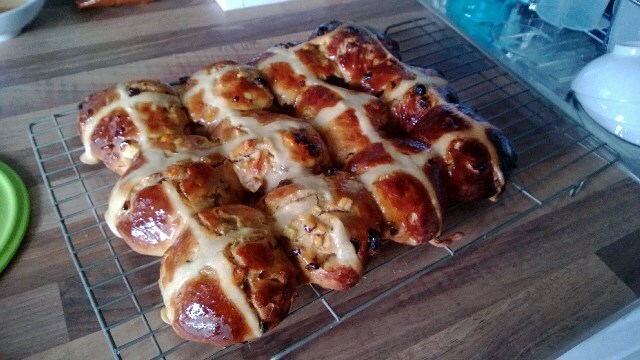 Below is my Easter effort. I have always loved hot cross buns and am quite happily to pick them up in early January as soon as the supermarkets put them out. Yes, I am complicit in that most hanous of activites – launching festive holidays early – but next year I might be able to bake them myself. As with most of my baking so far I was suprised how simple both were. They’re not perfect but as soon as I’ve nailed how to make my recipes slightly lighter I’ll be happy. Ever played a game that you know isn’t great but you can’t stop playing? That kind of guilty pleasure which consumes you against your better judgement. At the extreme end of this spectrum I’ve had that with Feeding Frenzy, an early XBLA game that saw you as a fish devour other fish. As a concept it wasn’t great, and its execution was similarly mundane, but something within it kept making me want to swim around a single-screen, two-dimensional fish tank and fill my fishy gut. It was not my proudest moment. Though even mentioning Sim City on the same page may seem a disservice to Maxis, I equally question why I have put so many hours into that somewhat flawed experience. It was supposed to be the coming of age for the venerable franchise but instead it has been a release dogged by server issues and filled with questionable design choices. And yet it is all too easy to sit down, intending to quickly check in on your fledgling cities, only to emerge several hours later not knowing quite what happened but by the proud mayor of a town boasting a new airport, to have struck a bountiful source of oil, or feeling the pressure of your voters as a crime wave grips their lives. Right from the start it’s devilishly moreish and keeps you glued to the screen as requests regularly arrive from your townsfolk, opening with a request for roads so they can build houses and settle down. As soon as you’ve committed that virgin strip of tarmac, a stream of new residents flow in from the region’s highways. Zoomed in you can see the tiny removal vans speed in and start assembling homes and moving equally tiny Sim families in. Before the paint is dry on their garage doors however they’re complaining there’s no power. Ingrates. So you open up the power options and decide between wind, solar, coal and oil. Certain towns will have obvious solutions, but this is only the start of it. Next come requests for water; and sewage treatment; then rubbish collection; it goes on. What started out as a simple and tranquil town where you drew pictures using the road network as your pencil, soon turns into a planning puzzle. Certain utility buildings, such as water pumps, might upset local residents if plonked next to them, but it’s a darn sight better than the sewage treatment plant being upwind from them. The trick is figuring out where in your plot of land you can fit everything whilst annoying the fewest people. Finding the corner of the city where the smell will go away from town, or the local bog that citizens won’t mind if you taint it a little as long as their streets are clean. In some way it’s as much you making moral calls as logistical ones as in cases there may be homes or businesses already sat upon that perfect spot. The other headache comes from the limited cash flow you start with. All these services cost money, to buy and to continue to run, and they need to be balanced against the taxes collected. Provide first rate services, costing the earth, and people may be healthy, employed, well-plumbed and happy, but the high tax rate will scare many off. Equally, dirt and germs may be cheap but don’t expect many takers. Businesses can bring in further streams of revenue too, easing the woes of your treasury. Casual players can skim the surface and can play around with growing large industrial hubs selling goods to shops, but a more advanced set of options lets you tailor your city to be the black-gold capital of the region with oil refineries and derricks, or attract in the high rollers by erecting neon lights and casinos up and down your strip. You can focus on trading, electronics or tourism, and each will vastly alter the makeup of your city and how the cash comes rolling in. Taking all of what’s on offer can be slightly overwhelming but the simulation underneath is at least sensible and spaces its requests out in the early days. Requests from Sims are as much a guidance along what to explore as they are indications of what’s faltering in your creation, and it’s easy enough to write the whole thing off as an experiment and start in a fresh region if the worst comes to the worst. What this all builds towards is the fun of founding, growing and specialising. Making sure all your Sims have enough jobs and health care to keep them happy, ensuring the place is attracting in visitors from the wider world to put extra coins in your pocket, and being the mayor of a sustainable city. Where you begin to see the cracks, however, is as your first creation reaches its limits. The cities are surprisingly small and it won’t be long before your buildings are pressed up against the border. There will be no teeming metropolises gently spilling out into suburbia and onwards to more green outlying villages, instead you will have constructed a solid square of concrete and iron and once you’ve filled it, you’re going to have to start recycling space. This may seem like a challenge, something put to you to test your mayoral wits, and to a certain extent it does as you bulldoze here and tweak there but there comes a point where it’s not worth it. The rewards earned for changing focus greatly or bowing to every Sim’s little request and upsetting the balance are negligible; there is a dearth of long term goals and so it’s often best starting afresh. Definite advantages await with this course of action, as cities in the same region all help each other, be it through trading utilities and resources, or sharing technological and governmental developments that unlock more advanced buildings. Neighbours can often be called upon to plug a shortfall in water or to employ some of your citizens, but it’s highly buggy. Shared power supplies will cut off for no apparent reason leaving your city in darkness and with businesses threatening to leave, gifts of cash and resources take an excruciating long time to travel between mayors, and direct interaction is so minimal that at times you question the online nature of the game. The visual representation of your city, spread out on the region plane sat in amongst whilst also seeing all your friends’, does provide a lovely diorama yet it just serves to highlight further how isolated you feel whilst playing. There are no great shared constructions of any meaning, no chance to co-mayor a city or change the face of the region, you operate in a completely solitary fashion. This in itself could just be considered a missed opportunity but when forced to focus on your own endeavours so much you realise there are fundamental problems at home, too. Bugs and inconsistencies with traffic pathfinding, business and the general sensibility of Sims can bring whole conceptual infrastructures crashing down. Sensible little assumptions that you make about life in your world are not replicated in the thoughts of your Sims. Businesses happily go out of business claiming they have no place ship freight to despite living across the road from a freight warehouse; Sims will die queuing for hospital treatment despite there being a queue-free hospital elsewhere in town; dim-witted drivers will clog roads meaning the fire brigade are stuck in jams whilst the industrial quarter burns freely. Each in isolation is irritating, possibly humorous, but when its replicated time and time again any long term goal you had for your city is an exercise in futility. That initial period, where you have nothing but a piece of green belt, maybe a strip of land by the coast, you put to one side the disgruntlement that ended your last venture and you see only potential. Maybe a series of well-to-do mansions could have views of the sea and bring in the high-rate tax payers, possibly this time you’ll pop down a concert hall and expo centre and dedicate this town to putting on shows, each time you’ll try something a little different to see if this time it sticks. More often than not there will be an early struggle as you balance out your ambition with the trickle of cash that comes in through tax returns. More often than not you’ll be distracted from your initial goal as you see what would happen if you unleash Godzilla through the streets. More often than not you’ll put together a working world that will quite happily tick by if you just stopped tinkering. For all its initial ambition it’s hard to consider Sim City as anything other than a let-down. Let-down or not, though, if you give me a sandbox I will keep on making castles.